Gulu — President Museveni has warned born-again pastors to stop preaching misleading gospel to believers which encourages laziness. Mr Museveni said he was once a born-again but later fell out because of "dangerous lies" spread by pastors. He was speaking at thanksgiving prayers for LC1 and LC2 chairpersons in Acholi Sub-region at Kaunda parade grounds in Gulu Municipality on Friday. Mr Museveni said the message he picked from the born-again gospel was that people on earth should not bother to work but only wait for wealth in heaven. He also cited the scripture in the Bible, Matthew 6:26, which says: "the wild birds do not plan their survival nor do they grow any crops but God feeds them." According to Mr Museveni, such preaching made him skeptical. His statement followed a testimony from Rev Fr Mathew Okun Lagoro from Gulu Archdiocese who told the President that Operation Wealth Creation [OWC] programme had alleviated poverty in the region. "I am happy that the religious people are now getting serious with wealth creation. Even Jesus worked in the carpentry workshop of his father himself. He fed the hungry, healed the sick and preached the gospel. Those are the four pillars. I am happy that the religious people now understand the issues of wealth here on earth as we wait for heavenly wealth," Mr Museveni said. He also warned christians against believing in miraculous wealth saying nothing like that happens without hard work. He advised the locals to adopt new farming methods to improve their output and livelihoods. Ms Grace Oleyowiya, one of the National Resistance Movement party members who spoke on behalf of the Local Council chairpersons in the region, however, reminded the President of unfulfilled promises to compensate war victims in Acholi. Ms Oleyowiya said more than 6,800 survivors of the atrocious insurgency by the Lord's Resistance Army rebels have not been compensated. She also said there is need to clear compensation of the Acholi war debts. More than 23,000 people who lost their livestock and other properties during the insurgency, under their umbrella body Acholi War Debt Claimants, sued government in 2007 seeking compensation of Shs1.4 trillion. However, later they opted for out of court negotiations but by 2013 government had only paid Shs7.05 billion to about 17,000 people. 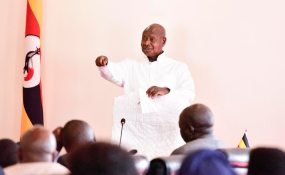 In response, Mr Museveni insisted the government is committed to paying the war debt claimants but it cannot pay them in full because of the infrastructural developments it is carrying out in the region. The President also said the delayed payment was partly caused by squabbles among some of the claimants who abused the first release of money. Reacting to the complaints raised by Mr Stephen Olanya, the LCI chairperson for Green Valley in Gulu Municipality on increment of annual ex-gratia payment from Shs 120,000, Mr Museveni said he had already directed the local government minister to work out a formula. "We are going to work out a programme on how to financially empower the leaders in the Local Council structures, the women structures and also the youth structures. It is clear that when you are in leadership, you neglect your own work to attend to the work of others," Mr Museveni noted. He promised the government will find a solution on how to empower the LCs in a way that does not look like a punishment. President Museveni also commissioned a factory of Equator Seeds Limited at Koro Abili in Koro Sub-county, Omoro District.